Census 1850* He appeared on the census of 23 November 1850 in Lowndes County, Mississippi. 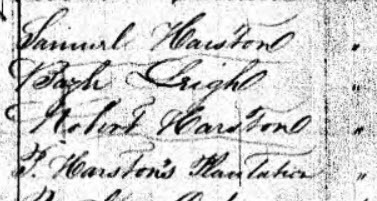 [S3296] Will of George Stovall Hairston -1820 - copy of will recorded in case #1833-008, Amos A. Atkinson & Wife vs. Exrs. of George Hairston, Chancery Records, Library of Virginia, Library of Virginia, Richmond, Virginia. [S1837] 1837 Mississippi Census - National Archives and Records Administration. [S118] Research and Papers of Judge Peter W. Hairston. [S96] Lowndes County Mississippi Will Book. [S261] The Daily Dispatch, Richmond, Virginia.